The Toronto Maple Leafs have won six consecutive games, and it is one of those times where they haven’t looked as good as their record is suggesting. 21 games into the season, Toronto has the third most points in the league behind Tampa Bay and St. Louis. They are tied for second in goal differential, second in goals for, and 16th in goals against. Digging a little deeper, they are 20th in shots on goal per game and allow the sixth most shots per game; on average, they get outshot by three shots per game. The Leafs‘ strength of schedule so far ranks as fifth hardest in the league. Although they get outshot generally speaking, their team corsi sits at 50.11% — 15th in the league — and they have the third highest team PDO in the league at 102.76. Only one team had a PDO of 102 or above last season and that was the President’s Trophy-winning Washington Capitals. I don’t know if you were watching, but the game wasn’t going very good. We weren’t very good, so it wasn’t about who I put them with. It was just that I had to do something different than what was going on. That has been a theme during this six-game run. They have been outshot in every game of the winning streak. In fact, of the 18 regulation periods played, they were outshot in 12 of them, tied in one, and outshot their opponents in the other five. It’s not a score effects thing; Andersen has been playing very well and keeping them in games. It is also worth noting that Auston Matthews has not been around for most of the streak, and when he has played, he clearly wasn’t at 100%. That makes a big difference. The good news is that the team is still winning and nobody is suggesting that a six-game winning streak is going to be sustainable. But the way they are arriving at these wins leaves some room for criticism. Leafs fans are all too familiar with winning games while being outshot and relying on talent to get you by. The numbers do generally point to the Leafs being a good team, even though they are leaky defensively. To add to that, the Leafs are in what looks like a pretty weak division. The Habs are quite clearly a disaster while Buffalo looks stuck in mediocrity. Florida does not appear to be any better than last year. The Bruins have been battling injuries all year, while Detroit has surprised a little as a middle-of-the-pack team so far. Tampa Bay is obviously very good, and Ottawa looks like they are going for it and will be a tough out. That’s not exactly the division of death. 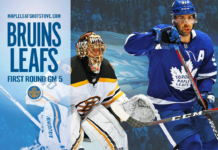 Heading into the Thanksgiving weekend – usually an checkpoint indicator for who is going to make the playoffs – the team should feel comfortable about their division and making the playoffs this year. But they know they will need to play better if they want to do any damage. I think Mike Babcock would be the first one to tell you that. – I was not surprised to see Connor Carrick jaw with Brendan Gallagher towards the end of the game after Gallagher took a healthy run at him earlier on. Carrick has a mean streak to him and a long memory. Last season, he landed a pretty big hit on Josh Anderson of Columbus and it caught me off guard a bit. After the game, Carrick noted that he had a history with Anderson going back to their OHL days. Some players take numbers and never forget. – That Hyman – Marleau – Brown line was a bit of a go-to for Babcock while Matthews was injured, while the Komarov – Kadri – Nylander combination dates back to last season. This season, Nylander’s CF% with Kadri is 42.52% and 53.32% without (Kadri’s is 50.23% without Nylander). Last season, it was 51.36% together, Nylander 53.12% without, and Kadri 51.13% without. They have only played together for nearly 60 minutes this season so the sample size is small, but one thing that stands out is that William Nylander and Nazem Kadri play at completely different paces – one slows the game down and is a bit more methodical in his play (Kadri), while Nylander is a speedy burner that strikes quickly when he rides shotgun with Auston Matthews. 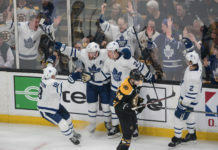 – Last season, Babcock reasoned that he didn’t want Mitch Marner with Auston Matthews because he believed that Marner could drive a line by himself. It is no secret that the JVR – Bozak – Marner line has struggled at times this season, with Marner demoted to the fourth line (along with PP duty) at one point. The Montreal game marked the first time Matthews and Marner combined for a goal together, and you wonder if he is softening on that stance on Marner — for at least this season — given his play. – Last season, we also saw that the Leafs tried to keep the lines as similar as possible when Marner missed some time due to injury by bumping Connor Brown up. I had wondered if Nylander might get a look at center with Matthews out, but Babcock generally likes to keep things as consistent as possible when someone goes down; that way, when the player returns, everything can go back to ‘normal’ as seamlessly as possible. – Nikita Soshnikov played 10:33 in his season debut, with 46 seconds shorthanded. His role on the team is as an energy guy and a shorthanded threat, but he struggles on his off-wing and has been at his best in the NHL playing on his proper side with a little more talent around him (e.g. Kadri and Komarov) than he got against New Jersey next to Martin and Moore. – In training camp, one player who came very close to making the team was Miro Aaltonen. In the AHL so far, he has eight points in 16 games (two goals) and is averaging two shots per game (32 total). I think the Leafs will be happy to let him develop down there a little longer as he continues adjusting to this ice surface and style of play. Have to hand it to Brown. What a great teammate and attitude to have. It would be easy to sulk. This was a nice piece of business by the Leafs. Leivo has struggled a bit this season and would have been in tough to earn a reasonably-sized contract in terms of dollars and length. Toronto forces his hand and offers him security at a salary that is probably above what he’d get on the open market today. Leivo happily accepts, and the Leafs lock in some good, cheap depth with the potential for more. Babcock does a really good job of encouraging players when they are struggling (at least publicly through the media). Toronto has a collection of young players who were all superstars growing up, and they obviously can’t produce like that all the time at this level (unless they are named Auston Matthews). Multiple talented players have seen fourth line duty the last two seasons, including Nylander, Marner and Brown, and he’s been able to manage their egos and develop players through their struggles. I really liked these two breakout looks from the Leafs. They are starting to come a little closer together, activate the defense, and generate a little bit more speed through the neutral zone. On the first breakout, Kadri swings low and then goes just past the center line (instead of the blue line), while Marleau clears out from his wing before circling back with speed. Instead of a long bomb pass and chip, it’s a tighter play. Marleau charges across and picks the puck up with speed for a chance. When the puck clears, we see Rielly charge up ice and again make a short pass between the blue lines before going up ice for another scoring chance. These are little tweaks, but they will serve the Leafs well. They are finally getting away from the long passes in neutral zone breakouts. 1. I think it was a little confusing when Babcock said the lines will go back to normal for the next game. I’m not sure the new lines were perfect and should stay intact, but the team also hasn’t looked good with the status quo in general and there have been some interesting combinations worth trying out (I liked the Marleau line with Hyman and Brown, and Matthews with Marner). The Matthews line is always good and the Bozak line has picked it up of late, but I’m not sure there’s a good reason for these four lines to be as automatic as they seem to be. 2. I think the Leafs should be looking at what other teams are doing on the penalty kill and replicate it when it comes to using some of their top talent while shorthanded. Montreal sent Pacioretty out on the PK and he was able to eat the puck in the Leafs zone a few times, while Boston is legitimately dangerous while shorthanded with Bergeron and Marchand on the ice. The Leafs are one of only four teams in the league without a shorthanded goal. Marner has looked good there in short stints in the NHL and played the PK all the time in his last season in London. I’m sure Kadri could also kill penalties considering his defensive duties at 5v5. I would probably not put Matthews out there right now, but there are a collection of options outside of what they currently run. 3. When the Leafs are on the power play, I think teams are starting to adjust to their favourite high-slot tip play, particularly when Marner curls up high and makes a slap pass. It’s still good a play and will continue to work, but Montreal read it very well on Saturday and the Leafs will need to work on an adjustment. Whether that’s the player actually shooting from the half-wall, or a down low play (on one occasion, Nylander passed it down low to Brown, who bumped it to the slot to Marleau and it forced a big save out of Charlie Lindgren), the Leafs will need to develop a counter punch because teams will catch onto this as their go-to. 4. Last week, I wondered aloud if Curtis McElhinney should start against Arizona. But with Andersen hot right now, I think it would be tough to justify taking him out. The team does have a back-to-back coming up this weekend against Carolina and Washington, so he should play once there regardless. Andersen has already played over 1,085 minutes this season – the second highest is Cam Talbot at 1,026. I think the Leafs are a relatively safe playoff team in this division, but if they want to do damage in the playoffs, I’d have a regular eye on getting Andersen some rest. So far, it has only happened in back-to-backs this season and the Leafs don’t have very many this year. 5. I think, looking at the Josh Leivo extension as well as Kasperi Kapanen and Nikita Soshnikov (in addition to other developing wingers in the system like Andreas Johnsson and Carl Grundstrom), the Leafs can justify losing JVR and Leo Komarov to free agency next summer. It’s a lot trickier at center, though. Going from Bozak and Moore to — let’s say — Aaltonen and Gauthier would be a sizeable downgrade. They can move Marleau there full-time, but I don’t think he’s at his best in the middle. I’m also not sure the Leafs want to split up Matthews – Nylander permanently. The free agent market leaves much to be desired, too. I’d at least be curious as to what money and term Tyler Bozak is looking for.